The New segment page displays. Select the appropriate rule type. 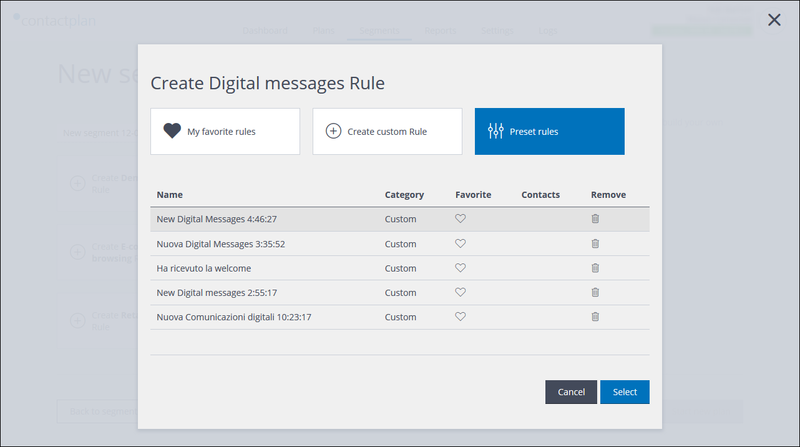 For example, Create Digital messages Rule. The Create Rule page displays. Click Preset rules and locate the relevant preset. In the Favorite column, click the heart shaped icon to highlight it. The rule is added to the My favorite rules list. The Preset rules list closes and you are returned to the New segment page. Click My favorite rules and locate the relevant preset. Click the heart shaped icon to remove the highlighting. Next time you open My favorite rules, the relevant preset no longer appears the list.